DPP lawmakers are expected to propose the establishment of the investigative committee at the legislature’s procedural committee meeting this morning, although it is unlikely to receive support from the majority of KMT lawmakers. At a press conference yesterday, KMT lawmakers denied any similarity between the two shootings, suggesting that the former president’s incident was staged, while Lien’s shooting included evidence of “real” bullets. There is not the slightest hint of conspiracy about the Sean Lien shooting incident. Consider: here is an incident in which a gangbanger accidentally shot Lien Chan's son on stage while attempting to off another apparent gang-connected politician and was prevented from completing the killing by a made guy in the Bamboo Union gang (an organization with old KMT connections) on stage with the KMT candidate. A perfect opportunity to relentlessly attack the KMT as a gang-ridden, corrupt, violent party. And what does the DPP do? Natter on about conspiracy theories! Be serious! Heck, even if this was planned at the highest levels, forget the conspiracy hunt! It'd be far more useful to relentlessly go after the KMT with this gangster fodder they've handed the DPP. Or at least have some class and STFU. Let's not even go into what those idiot herd-voters in Taipei have now proven beyond the shadow of a doubt, backed up by officials from the KMT and the DPP: that bullets can affect elections. What signal have we sent to gangsters with all this non-pursuit of gangster connections and politics? Great work, folks. Finally, if the DPP wants to put its energy into a Truth Commission, by all means let us emulate South Africa and not the Warren Commission. Thousands of dead from the martial law era cry out for justice. Focus your energies there, DPP. Su Jia-chyuan said he will recommend that the party's Central Advisory Committee kick out those named by the respective council caucuses as having failed to vote according to caucus resolutions in the elections for speakers and deputy speakers in the five special municipalities. One of these apparent wayward councilors was Lee Wan-yu of Xinbei City, who cast her ballot for herself rather than for the party's nominee for speaker. DPP Xinbei City branch chief Wu Ping-jui said Lee violated the caucus resolution and that the caucus has therefore decided to kick her out. An official request to that effect will be sent to the party headquarters the following day, Wu added. The KMT is mulling similar action against its own party members. Many people appear to think that discipline was the antithesis of democracy. But actually it is democracy in action. This is just a variation of the old principal-agent problem. If you hired a lawyer to represent you, and he entered a guilty plea when you instructed him to plead you not guilty, you'd can him. Similarly, if you played guitar professionally, you'd fire a manager who got you juggling gigs. If you owned a store and told the salesman to sell the cameras at $500 and he sold them for $1, you wouldn't let the salesman plead that "it's democracy." He'd be gone. The vote for city council members is a procedural move to determine a party's clout in that deliberative body. By voting against your own party, you vote against your party's clout in that body, thereby reducing your future effectiveness and that of your fellow party members. Further, you give voters -- not just your voters but all your party's voters -- the middle finger, since you reduce your party's clout. Representatives who take the resources of Party A to get elected and then vote for Party B are immoral and untrustworthy. They should be disciplined, like any contract breaker. That will send a signal to future voters that the party is worth doing business with. You might argue that representatives should be able to vote their consciences. Sure, as a voter I might forgive a representative for voting her conscience on an issue of conscience, but there is no issue of conscience here. This is a procedural vote. Further, the wrong votes are all about either corruption or faction fighting or personal politics, the triple curse of politics here in Taiwan. No one is voting against their own party's recommendation as an act of conscience. One powerful way to end the corruption, factionalization and personalization of politics in Taiwan is to enforce party discipline and punish individuals who engage in those practices. That way we get more democracy. That way we get functioning parties that can carry out policy programs, which is why we put them in office in the first place. In China, government assaults on free expression regularly generate attention around the world. Less so in other parts of Asia, alas. So when Taiwan's telecommunications and broadcasting regulator rejected my company's application for new cable TV licenses multiple times in the last year, most recently last month, the news went almost unnoticed outside Taiwan. We are not the only media company affected; the government of President Ma Ying-jeou has undertaken several initiatives to restrain the previously vibrant Taiwanese press. As the majority owner of Next Media, I have a strong vested interest in this particular case. However, I believe that anyone who values the free flow of information—not to mention the future of a free Taiwan—should be concerned. In delivering its decision, Taiwan's National Communications Commission cited concerns that we might not be able to satisfy various regulations, and that we might try to circumvent existing program-rating restrictions. Most ominously of all, the NCC said it could not be sure that Next Media would "fulfill its social responsibilies as a mass media operator." These are all shockingly subjective rationales. Instead of dealing with the facts and merits of our application, the NCC is punishing us on the basis of what we might do. Next Media has been an effective competitor in the Taiwan market, and it is likely at least some of the pressure on the NCC comes from media firms that do not want to compete with Next. Apple Daily, the print rag, has managed to do something amazing in Taiwan's partisan media environment: it has positioned itself as an unaligned media outlet. Nor has the government stopped with Next TV. Last week, the NCC revoked the entertainment channel license of another broadcaster, ERA TV, sparking protest from some lawmakers. In an even more worrying development, the Taiwanese legislature is now considering a bill that would ban news outlets from "describing or illustrating violence, bloodshed, pornographic sexuality, or lewdness in detail." The language containing this provision is part of a group of amendments being pushed by an NGO called the Child Welfare League Foundation, as well as by the Taiwanese government's Child Welfare Bureau. The goal, to shield children from violent or graphic content, is a laudable one. But in practice, this law would have a chilling effect on reporting for children and adults alike. So vague is the wording, it has the potential to impact the reporting of every crime, every accident—not to mention every embarrassing misadventure by a Taiwanese politician. Here it helps to remember that though the NCC is an ostensibly "neutral" body, its members are nonetheless nominated in proportion to the number of seats of political parties held in the legislature. Today the KMT has an overwhelming majority in Taiwan's legislature and holds the presidency. So one has to wonder whether the quality of reporting in Taiwan is really the driving concern here. The NCC would not undertake actions that endanger press freedom and the reputation of Taiwan if President Ma and the ruling KMT did not back their actions. Commission spokesperson Chen Jeng-chang (陳正倉) said ERA TV’s operating license was issued on Feb. 27, 2004, and expired on Feb. 26. The first was that the channel’s content must abide by Articles 17 and 19 of the Satellite Broadcasting Act (衛星廣播電視法) — which in general terms regulate content and hidden advertisements respectively — for a period of a year following renewal. The second stipulated that program reruns could not exceed 60 percent of daily content. The channel had three violations since February, Chen said. The most serious was in June, when the channel was fined NT$1 million for failing to distinguish between regular programs and commercials, thus violating Article 19 of the act. “The commission sent an official notice in July, which informed the channel it had violated the conditions for its license renewal,” Chen said. The channel was also fined NT$2.1 million as it continued to operate after its operational license became invalid in July. The interesting thing is whether the shutdown of ERA is what it appears to be on the surface, a reasonable response to a continuing problem, or whether it is the opening salvo in an assault on the media for political purposes, in which ERA is the "reasonable" victim that makes more outrageously politically-motivated attacks possible. Although the practice, also known as placing “advertorials,” was adopted 10 years ago when the Democratic Progressive Party was in power, the KMT did not address it after regaining power in May 2008, [Premier] Wu told reporters. Product placements “deceive” people, he said, because they are a form of paid advertisement masquerading as a news story. “While it is impossible for -governments or companies to refrain from running promotions or advertisements, a line must be drawn to distinguish promotion and advertisement by businesses, political parties or individuals from objective news stories,” Wu said. The controversy over the government’s use of advertorials came to the fore after veteran reporter Huang Je-bing (黃哲斌) resigned from the China Times on Dec. 12, likening the practice to the use of propaganda by the Chinese Communist Party. On Sunday, more than 100 reporters and professors of communication at various universities signed a petition calling on the government to stop resorting to advertorials, a practice they claim has grown substantially under the Ma administration. In 2008, Ma signed a pledge opposing embedded marketing of a political nature, but since then the government has continued to use taxpayers’ money for this purpose. According to ratings published late last year by AC Nielsen, advertising for the top 50 government agencies topped NT$1.24 billion (US$42 million), and the combined advertising and PR budget for the Mainland Affairs Council (陸委會) was as high as NT$180 million. These attempts to strip the fourth estate of its right of supervision and oversight threatens to destroy the core value of news reporting. This attack on the freedom of the press could force Taiwan even further down international ratings. The Economist Intelligence Unit’s Democracy Index, compiled by the UK’s Economist magazine, has even returned Taiwan to the “flawed democracy” category. 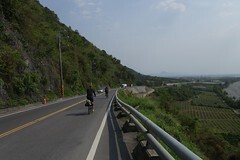 A PRC citizen's bike ride around Taiwan. Truly excellent pics (the third page has great east coast pics). Could do without the asinine "Taiwan China" under every pic. International Human Rights are dead; China has killed them. Public confidence in Ma drops. LTH: 1992 Consensus a fabrication. Ma: DPP impractical on 1992 consensus. The reality is that since the CCP would talk to the KMT without any formal "consensus" it is the KMT that is proposing something entirely superfluous. This is all about rhetorical attacks on the DPP. Japanese believe their nation should support US in defense of Taiwan. What should Xinbei be called? Call it Shuangho (雙河). This would be Twin Rivers in English, giving it a pleasant, pastoral sounding name representing the Danshui and Keelung Rivers that flow through it. In Chinese it would have not only the two rivers(河), but also the two "ho-s", Yungho (永和) and Chungho (中和), and thus be a nifty play on words. New North City is lame. New Taipei City is ok but boring. Your suggestion? 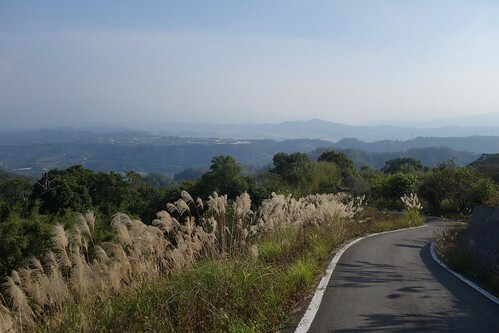 On the descent from 130 in Miaoli down to the valley just below Sanyi. A lovely ride, perhaps I will hit it again tomorrow. My son wrote this on FB today: "Just got called by gangsters based in China, trying to scam me into giving them cash. I answered in English, "Hello?" and the tape recording stopped abruptly and I could hear a lady in the background distinctly say "American" in Chinese and hang up. Best way to get rid of those phone scammers is answer in English lulz." Meanwhile, what's the inside story on the blogs today? Claudia Jean with an awesome, detailed post on Frank Hsieh. Not to be missed. The African-Chinese guy visits Yilan. Kaminoge on the ROC scarf. Ben on Ma's revelation that the DPP is not part of the ROC. FOARP finds a poem about Taiwan identity. Catching Largemouth Bass in Longtan. Municipalities: rural residents of the new cities are worried urban areas will take more resources.The new cities hold 60% of the nation's population. Less democracy as new chiefs will be appointed by mayors and thousands of local councilmen will be out of work. More headaches for civil servants in adjusting to the new territories. Greater debts for the smaller governments. More debt discussion. Megacities face finance issues. China will shift focus and talk about/to DPP more in 2011 to help Ma in 2012. First new Orion anti-sub aircraft to come online in 2011. Yay! Can the US still protect Taiwan? Yilan county passes resolution blocking entry of CCP officials suspected of crimes against humanity. Factories orders jump in US, good news for Taiwan. Taiwan should consider capital controls. The Liberty Times report on Ma's entirely true words on pandas and black bears was detestable. If only the president would follow up with meaningful investment in black bear conservation instead of helping China. Taiwan bank, Bank of China sign MOU. JOB: A friend of a friend wants some one on one English tutoring in Taipei. Contact Michael J Klein at thenhbushmanATgmail.com Sorry, that is all the information I have. While local council heads are traditionally dominated by Chinese Nationalist Party (KMT) and independent councilors, the DPP, for the first time in the nation’s history, took both the speaker and deputy speaker seats in the Greater Tainan City Council, as well as deputy speaker seats in the Taipei and Greater Kaohsiung City Councils. In Taipei City, the incumbent council speaker, Wu Bi-chu (吳碧珠), of the KMT garnered 37 seats and won the seat for the fourth time, while her DPP rival Lee Chien-chang (李建昌) received 32 votes. However, DPP councilor Chou Po-ya (周柏雅) defeated the incumbent deputy speaker Chen Chin-hsiang (陳錦祥) by a 30 to 29 margin, making him the first-ever DPP member to serve as deputy speaker of Taipei City Council. The KMT accounted for 30 of all 62 Taipei City councilors, while the DPP garnered 23 seats. There are eight councilors from the New Party, People First Party and Taiwan Solidarity Union, and one independent councilor. In the Taipei City election the KMT managed to unite behind the speaker, but split for the vice-speaker election due to the usual situation of one politician angry at another, with the PFP switching sides. Still, it is progress. Under the tabled revision, special municipalities are set to receive 61 percent of the money set aside by the central government, up from 43 percent and roughly proportionate with their share of the population. At the same time, the share given to counties and local municipalities will fall to 24 percent from 39 percent — a figure that the county commissioners yesterday want revised upward. Yunlin County is close to being unable to pay either the salaries or year-end bonuses of its 100,000 public servants. Yilan County has a NT$20 billion (US$669.8 million) debt that is not getting any smaller, while Chiayi County has a NT$3 billion deficit it has not been able to reduce this year. Last year’s audit report revealed that up until the end of last year, of the eight cities and counties that will make up the soon-to-be five special municipalities, Taipei City had the highest overall debt at NT$291.7 billion (US$9.58 billion), followed by Kaohsiung City at NT$211.2 billion, Taipei County at NT$108.1 billion, Taichung County at NT$48.5 billion, Tainan County at NT$44.5 billion, Tainan City at NT$31.7 billion and Kaohsiung County at NT$26.4 billion. Taichung City had the lowest overall debt at NT$7.2 billion. A 2009 audit report showed that until the end of last year, the eight cities and counties set to make up the country's five new special municipalities from Dec. 25 had an estimated US$26.6 billion of debt, including money owed to national health and labor insurance programs, pension contributions and interest payments for the pension schemes of civil servants. Taipei City had the highest overall debt at about US$9.9 billion, followed by Kaohsiung City with around US$6.6 billion. Taichung City had the lowest overall debt of US$238 million, but its debt is set to increase to US$1.7 billion after its merges with Taichung County to form a special municipality on Dec. 25. Stressing that all resources would be equally shared and fairly distributed, she also pledged to reduce the gap between rural and urban areas. “I pledge there will absolutely be no such thing as a so-called ‘one city, two systems,’” she said. She also called on the central government to attach more importance to the voices of southern Taiwanese. The president also reaffirmed that the “1992 consensus” is the foundation for progress made in cross-strait relations since he took office in May 2008. Ma's stance is interesting. (1) the US has made no public acknowledgment of the 1992 Consensus. All it has done is made happy noises about the CCP-KMT talks. (2) China has never accepted the 1992 Consensus either (not that it matters to China, so long as the KMT serves its interests). Did I forget to mention that the 1992 Consensus doesn't exist (so why should the DPP accept it)? This is just the President's way of dressing up party-to-party negotiations in a little diplomatic dignity. More interesting is that even as the President acknowledges the presence and necessity of the DPP, he is attempting to marginalize it by painting it as the one out of step with history (note also the subtle appeal to "inevitability"). This is a common strategy opponents of the DPP use. One wonders how Ma sees the DPP here -- as representing the Taiwanese? Because it is obvious that he is including it out of the ROC in this very revealing remark, while making the KMT and the ROC mean essentially the same thing. Party-state ideology of the kind that gave us five decades of martial law apparently still colors Ma's view of things. Another thing worthy of note is that the Democratic Progressive Party (DPP) made was less critical of cross-strait affairs during the recent special municipality election campaigns than it has been in the past, and once they were over the DPP announced its intention to establish a think tank aimed at initiating exchanges with China. This implies an acceptance that regardless of which party holds power, cross-strait exchange is now an unstoppable trend. Both the retired Chinese and Taiwanese officers had things that they insisted on, but the Taiwanese side rejected the currently optimistic Chinese view, stressing Taiwanese democracy and identity. The reason that the 1992 Consensus isn't "accepted" by the DPP is that it is not rooted in this vision of Taiwan as a democratic and independent state with its own identity, but rather, in the KMT's Return to Zion theology of One China in which Taiwan is annexed to Beijing. The 1992 Consensus is a rejection of Taiwan's separate and independent identity. Nor does the "1992 Consensus" have any democratic legitimacy -- it was negotiated by a government that got to power by silencing its opposition. China's military still struggles: Pomfret in Wapo. Survey shows....Taiwan housing prices way too high. Four new municipalities kick off today. The Taoyuan Tableland and its ponds. The international airport is in the upper right corner. I was hunting around for a place to bike tomorrow, looking for an old Qing dynasty canal in our fair city of Taichung, when I stumbled across this page on "Taiwan's Beautiful Canals and Ditches." Put off by its odious oily oozing Chinese-centrism, I left a note there to remind them that the aborigines had constructed waterworks long before the Han conquistadors and settlers showed up. However, as I did so, my roving eye fixed on something on that page I had seen dozens of times, but had never noticed before: the ponds of Taoyuan. Those shining mirrors are the county's agricultural irrigation ponds. The Longtan pond was the first, built in 1748. The region's irrigation system has developed gradually, pond-by-pond, over the past 261 years. Each pond stands as a historical record of how local families brought the land under cultivation, and at one time, there were more than 10,000 such ponds in Taoyuan. However, urban expansion has led to the destruction of many of these ponds -- one recent survey shows that there are only 693 left -- with each one filled with dirt marking the end of the history of certain families, as well as the loss of habitat for water birds. According to the survey, each pond can provide territory for an average of seven water birds. With an estimated 7,000 hectares of pond lost over the years, this represents the loss of habitat for nearly 50,000 birds. The article goes on to say that the ponds are particularly vulnerable to destruction by Taiwan's developmentalist sociopathology. Irrigation regulations require that a given pond have only one owner. Hence, negotiations for ponds are easy since construction companies do not have to deal with more than one owner. The ponds were usually built in the lower areas. Builders dig both the red soil and pebble layers, then encircle the area with banks. The red soil is highly adhesive. When mixed with pebbles and pressed tightly, a waterproof bank can be made. Banks encircle the ponds in the low areas. Before the Shih-men Reservoir was constructed, ponds were the major source of irrigation water. According to statistics, there were as many as ten thousand ponds on the Taoyuan plain before the great drought in 1913. At that time, Taoyuan Hsien was known as the "thousand lakes hsien". All ponds were connected; and thus an irrigation system was created. The ponds were also supplanted by other waterwork construction in the twentieth century. After the Taoyuan Main canal was completed during the Japanese period and the Shihmen Reservoir came online a couple of decades later under the KMT, the new infrastructure became major sources of irrigation water for the area. The ponds were also integrated into central government systems during the twentieth century. Nevertheless, a little over 50% of the area's irrigation water continued to come from the pond and weir system. The Taoyuan Irrigation Association mandates that the ponds must be 80% full at all times, as a backup irrigation system in case of drought. A big mound of earth sits next to a factory in Three Lakes Village, brought in to fill in nearby ponds. Yen points to the mound and comments, "There used to be ponds here about two meters deep." Of the three or four ponds nearby, one has been filled in, one has been converted for recreational fishing, and one has been drained. A few aquatic plants can still be found in the boggy area left behind after the one pond was drained. "There used to be frogsmouth all over the place," laments Yen, "but even that is disappearing fast." Insectivorous sundew plants once grew in the rice paddies right next to the factory, but are no longer to be found (here). Sadly, the ponds are rapidly disappearing, in many areas remembered only by placenames like Dragonlake, Three Lakes Village, or Big Lake. The focus on saving wetlands in Taiwan has primarily been on areas next to rivers or the ocean, the ponds of Taoyuan, of deep argicultural, environmental, and cultural interest, have somehow slipped off the radar. So next time you fly out of Taoyuan Airport, look down. There'll be fewer ponds when you get back. A spider guards her eggs. When most people think of natural disasters, the ones that spring to mind are events such as earthquakes, typhoons, or floods. Yet perhaps the most influential, and destructive, of natural disasters is one that few immediately think of: drought. The impact of drought on history is profound. It may have been long-term drought that sent Homo sapiens out of Africa in search of new lands to colonize. 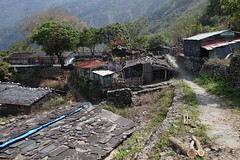 In Taiwan drought has been a regular feature of the island's history. For example, the massive drought of 1638-9 was part of a larger pattern of drought across Asia that may have contributed to the end of the Ming Dynasty. 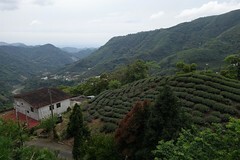 Though we often think of Taiwan as a wet, green island, droughts of varying severity are quite common in Taiwan. In the last century, southern Taiwan has undergone a long-term decline in rainfall and water shortages and droughts have become more common. In the north rainfall has increased, but in both places the number of rain-days has fallen and dry days increased. Overall, between 1945 and 1960, the island's rain patterns began to shift, with drought worsening in the south and the center but declining in frequency for all but the worse droughts in the north.1,3 Global warming, driven by human activities, is one obvious culprit: Taiwan's years with the most rain-days all occurred before 1953.2 Southern Taiwan, the island's agricultural heartland, is feeling the biggest impact. Drought actually comes in several flavors. Meteorological drought, discussed in the paragraphs above, refers to the conventional idea of no rain. Hydrological drought is concerned with how meteorological drought plays out in local water basin systems. It takes longer for precipitation deficiencies to show up in components of the hydrological system such as soil moisture, streamflow, and ground water and reservoir levels. As a result, these impacts are out of phase with impacts in other economic sectors. The rapid declines both in precipitation amount and days in southwestern Taiwan for the past 60 years have resulted serious difficulty in the water resources management. For example, the extraction of surface water for the water usage in Taiwan has been diminished from 150x108 m3 in late 1970 to about 120x108m3 in 1990s, a 17% shortage of average annual demand (~180x108m3). The major water deficiency occurs in the southwestern region that has been suffered the heavy reduction of precipitation for the past decades. Groundwater has been forced to significantly increase to meet the overall water demand every year. Consequently, over-exploitation of groundwater since 1980 caused chain-series effects, such as groundwater level waning, land subsidence, seawater intrusion along the coast and groundwater quality deterioration (Wang et al., 2004). River pollution is another critical problem for the southwestern Taiwan partly due to the drop of precipitation of the past decades. The disastrous effects of both drying and drought show how much more expensive drought is than other natural disasters -- its effects are long-term, subtle, and profound. It is sobering to imagine the south in its global context -- rainfall in southern Taiwan is three times the world average, yet the area is constantly afflicted by drought and water shortages. Pressure to move people inland has led to road construction and deforestation, both of which have contributed to an already high denudation rate of topsoil. As a consequence of this, thirteen rivers in Taiwan are now ranked among the top 20 worldwide in terms of sediment yield. [Rapid run-off of water resulting in water shortages] is especially serious for Taiwan because the island is so highly dissected geographically. Many places in the central mountain ranges are geographically classified as extremely dissected with a roughness of >160 m km-1... Only 0.4% of all land on Earth is dissected as much. Luckily in 1993 Taiwan began shifting to a more conservation-oriented forest management system which has impacted this situation positively. 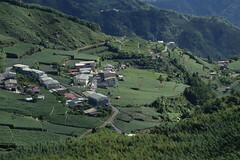 Still, as the article above observes, inter-basin management in Taiwan is difficult because the mountains are so steep. Exacerbating the various problems are the island's water management policies, including the low price of water which encourages overuse, the lack of support for conservation, the refusal to enforce groundwater pumping rules, and the preference for large, water-intensive industrial projects, especially in the south. What does this mean? Sometime in the next few decades these trends -- overuse of water, frenetic groundwater pumping, subsidence, seawater intrusion, drought and long-term drying -- are going to come to a head in southern and south-central Taiwan and force major changes in agricultural production and water sourcing. Perhaps someday resources such as deep-rock aquifers in Taiwan may be exploited, but at present, much of the impact of long-term warming could be mitigated by sensible water policies, enforcement of water regulations, and shifts in crop preferences and production methods. Yet there seems little momentum for that at the central government level. Hopefully one of the political parties will take get out ahead of the curve on this key issue. Mile High Cafe atop 130 in Miaoli. I would like to bring to your attention an amendment that is currently making its way through the Legislative Yuan that if passed could have a profound effect on press freedom, and consequently change the way news is reported in Taiwan. Article 90 goes on to state that offenders (those in charge of the newspaper or news channels) will be fined between NT$100,000 and NT$500,000 for each offense. I believe the amendments have passed the first reading in the LY and are currently in the committee stage after being sent back for revisions (more than once). The NGO however is apparently unwilling to drop or amend the offending article. 1) The idea of censoring news in any way is an attack on press freedom. 2) An NGO ostensibly acting on behalf of children should not be allowed to affect the way a whole nation receives its news. 3) Censoring news detail that is deemed unfit for children also means adults are prevented from reading or viewing the same content. 4) The article’s definition of the potential offence(s) is entirely arbitrary and open to widely differing interpretations. While it is undoubted that the intentions behind such an amendment are noble, it is hard to believe that the NGO believes that by avoiding reporting on problematic social issues that those issues will go away. The Interior Minister will chair a public hearing about the amendment Monday Dec 27th. Ben on police officers muzzling a protester of the visit of Chen Yun-lin to Taiwan. Taiwan legislators concerned about the nation's FTA strategy. A new blog on fishing in Taiwan: Taiwan angler. Looks great. If only I knew why fishing was called "angling." Probably just spelling-challenged fisherman leaving off the 'D' at the beginning. EU gives Taiwan visa waiver. There's no angle from which the Kuokuang petrochemical complex is not a disaster. Cancer, as well. Stop that monster before it eats Changhua. This was the envelope electric bills came in recently. It shows a lighter skinned policeman busting a goatee'd, dark skin, curly-haired fellow for stealing cable. ....though satisfaction rose only marginally while dissatisfaction rose perceptibly. Ma remains a lightning rod for the economic stagnation and rising housing prices that many ordinary individuals are facing. Too, I don't think he's ever been able to shake the perception that he is weak. ...the gray line represents "maintain current status and decide in the future", the brown represents "support independence", the orange is "maintain current status permanently" while the black is "support unification." About 10% have no opinion in this poll, but it is clear, as always, that few in Taiwan want to become part of the PRC. The poll on DPP China policy asks whether the DPP should adjust its China policy and gives three options -- become more open, become more protective, or not change. Among all surveyed, over a quarter gave no answer and 53.7% thought the DPP should become more open -- whatever that means. Among those saying they were DPP supporters, 45.9% thought the DPP should be more open. Whatever that means. Today has been a depressing and frustrating day, but I snapped this lovely pic the other day on my way out to Miaoli. So enjoy. Drew rolls 183 kms through the mountains. Brian Dunn points out that India did not reiterate support for the One China policy at its most recent meeting with Beijing's minions. China's claim to a whole Indian state has now made that impossible. Patrick fights back against mei ban fa. Videos from the American Footsteps in Taiwan exhibition. Wang Dan: five lessons for Chinese democrats and also a piece by an official of China's Taiwan affairs office on President Ma's China policies. All that awesome foreign investment in Taiwan to take advantage of ECFA? Oh yeah, still playing wait-and-see. Another great victory for the China Cargo Cult. This Chatham House report on Taiwan and ECFA etc is a bit fantastic but cites one of the best observers of local political life, the redoubtable Michael Fahey. The Diplomat's Jason Miks argues that F-16s should be sold to Taiwan, and implicitly, F-35s to Japan. Time for the US to get serious about China, in other words. Video: Delivering flowers to the Chinese Embassy in the Netherlands for Liu's Nobel. And more video: protesting Chen Yunlin's most recent visit to Taiwan. Amazing, the power of the Nobel + Chinese intransigence to make Liu into an international symbol. Chinese fishing boat rams S Korean Coast Guard vessel. Link behind wall, but the latest EU Blueprint favors dropping embargo to sell weapons to China. Do Europeans really think that if they sell weapons to China, they can keep their grip on their weapons technology? Read Jason Miks' piece above on the Russians, and rethink this. Liu Shih-chung with great piece on dealing with a resurgent DPP. Will the US view the DPP as an opportunity and not a problem? Taiwan and Japan hold forum on the Senkakus. DPP says that ECFA provides no protection for Taiwanese citizens or investors and many of its agreements are empty. Legislature to revise rules on local farm associations to make it easier for individuals of ill repute to stand for election and take positions. Taiwanese art on exhibit in Budapest. Indigenous people call for autonomy for five townships in the soon to be created municipalities. S Korean FTA with the US leapfrogs "advantages" of ECFA signing for Taiwan. But we all know the answer to Taiwan's economic problems: more China! Ken Anderson over at Volokh ponders what hegemony means in the rising China context. NT dollar reaches 13 year high. China to build aircraft carrier, reports FT.
Taiwan's navy searches for subs....from Russia? Interesting article on Taiwan's search for weapons. Don't miss: Commonwealth English: ten families own a quarter of the Taiex: "The latest CommonWealth Magazine statistics show that Taiwan's top ten business families control 13 of the island's financial groups and business conglomerates. The 77 companies – listed or traded over the counter (OTC) – under these business groups account for only 5 percent of the total number of listed and OTC companies, yet their combined market value exceeds NT$6 trillion, accounting for 25.7 percent of the stock market's total market value." China to deploy permanent patrol vessels in the Senkakus "The official with the Ministry of Agriculture's Bureau of Fisheries took the unusual step of granting an interview concerning the Senkaku issue to a foreign media outlet on Saturday, saying that China was planning measures to challenge Japan's control of the islands off Okinawa Prefecture." I'm feeling like the Emperor in B5's The Coming of Shadows, asking the Vorlon: "How will this end?" Anyone remember the Vorlon's answer? Japan re-orients defense posture on China, but only modest changes in capabilities, says the CFR. Ricky Gervais on why he is an atheist. In the WSJ too -- great job guys! Ted Cox on why he gave up Mormonism for atheism. Hubble Telescope: lovely animation on its recent discovery of galaxies. Brilliant work! Washington City, April 13, 1869. I nominate Capt. 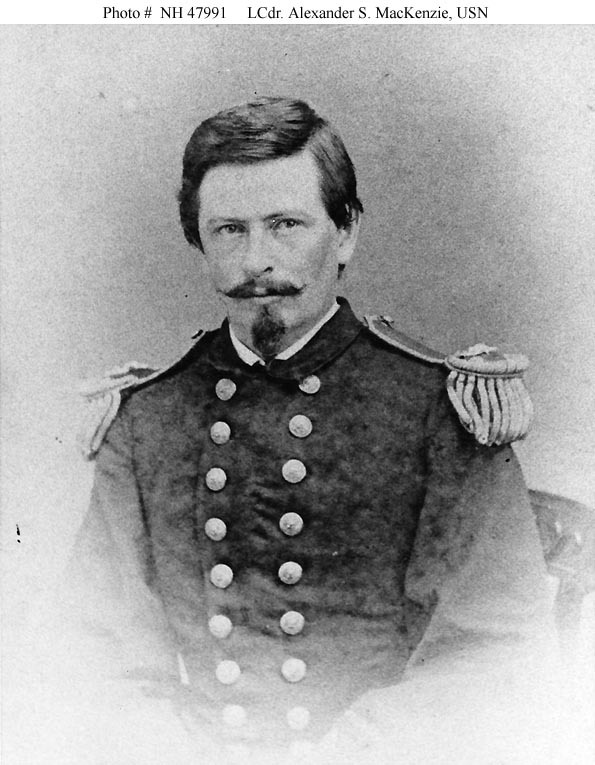 James Forney, of the Marine Corps, to be brevet major in said corps for gallantry in action against the savages of Formosa, to date from the 13th of June, 1867. Marines in action against the "savages of Formosa"? James Forney later became a civil war hero and rose to high rank in the marines before being court martialed for corruption, but the incident to which this citation refers is one of those fascinating little moments in 19th century imperialism, when a punitive expedition was driven off in defeat. On March 12, 1867, the American merchant ship Rover hit a reef near Oluanpi, Taiwan's southernmost point, and drifted north towards what is now Kenting. The ship soon sank, but the Captain, his wife, and the crew got off in small boats. In revenge for previous killings of local aborigines by foreigners, the local aborigines (called the Koaluts at the time) killed everyone who made it to shore, excepting one Chinese sailor. That sailor found his way to Takao (Kaohsiung), where he notified the British consul, who in turn notified the British ambassador in Beijing, who passed the information along to the US ambassador there. The British dispatched a gunboat from Taiwanfu (Tainan) in late March to search for survivors. The aborigines descended on the sailors searching the area, driving them back to the ship, which responded by shelling them, and then leaving. Early in April of 1867 the US Consul in Amoy, Charles William Le Gendre, traveled to Foochow to see whether he could persuade the Qing authorities to act. The governor-general gave Le Gendre a letter of introduction to the Qing official in Taiwanfu (Tainan). Le Gendre arrived in Taiwan on April 18, where Qing authorities evinced little interest in the incident. They told Le Gendre that the aboriginal districts lay outside their authority. 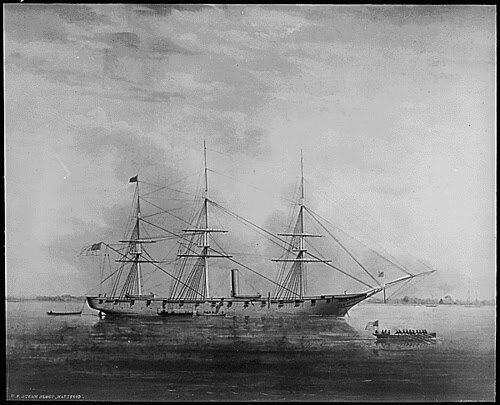 Months went by as diplomatic messages were exchanged, and finally on June 13, 1867, two ships, Hartford and Wyoming, along with 181 officers, sailors and marines, were dispatched by the Americans to punish the "savages", accompanied by the British consul at Takao and a couple of British citizens. Davidson complains that this was far too late, since even if some Americans had survived, it would be unlikely that any were still alive after so long a delay. Alas for the Americans, the punishment was meted out to them. The marines and sailors landed on June 13th. The heat was overwhelming and the troops were felled by sunstroke and exhaustion. 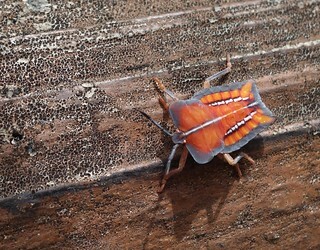 "The savages," wrote the commander of the land expedition, "dressed in clouts, their bodies painted red, were seen through our glasses, assembling in parties of ten or twelve on the cleared hills about two miles distant." The aborigines sensibly fought from cover on a hill above the Americans, remaining invisible to the American force but keeping the sailors and marines under constant musket fire. "It was impossible to tell the position of the enemy until we saw the smoke of his pieces, and we were obliged to fire at the flash. We were in plain sight, an open mark for the enemy, while they were hid in this undergrowth, into which we could not see ten feet," complained one of the officers in the NY Times. Forney was in charge of skirmishers deployed in front of the US troops in this battle. "Attack of the United States marines and sailors on the pirates of the island of Formosa, East Indies." 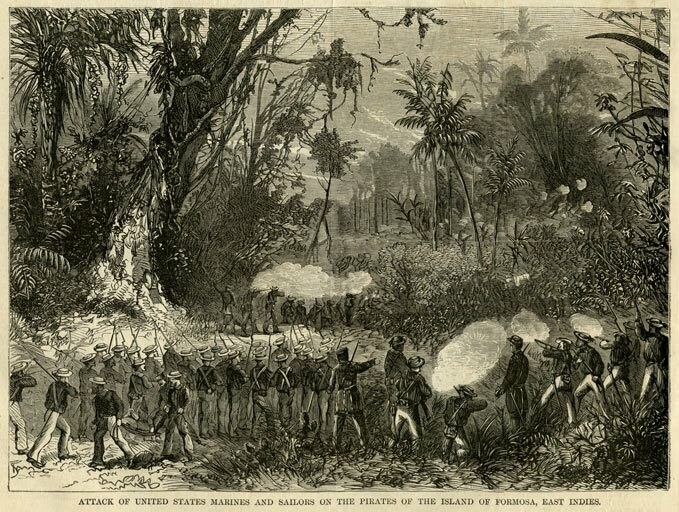 After several hours of plunging into ambush, the first battle casualty occurred when Alexander Slidell McKenzie, second in command of the expedition, was killed leading a charge uphill against the aborigines. Despite the Sharp's rifles that half the company possessed (aborigines in southern Formosa had fled from volleys of the new breech-loading rifles of the Prussian steamer Elbe in 1860, the first use of the revolutionary new Prussian weapon in combat), they were unable to drive off the locals. 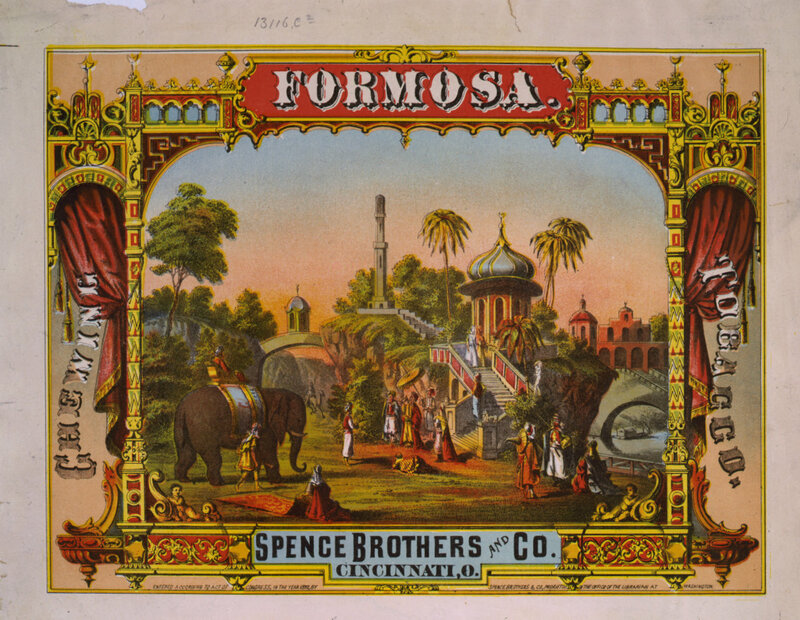 Instead, the "Pirates of Formosa" as they were styled in the NY Times, had driven off the expedition in defeat and disarray. The retreating Americans made up for the defeat by burning a few huts on their way back to their ships. The aborigines, observed the US ground commander, displayed "a strategem and courage equal to our native indians." Davidson's comment on the incident summarizes the attitude that underlies 200 years of American intervention in foreign lands: "After this ineffectual attempt to bring the Koaluts to reason...."
A. S. McKenzie, killed in the skirmish. Rear-Admiral Bell reported that it seemed unlikely the area could be stabilized unless a Power was willing to create a settlement there to pacify the area, but the Qing appeared reluctant to do so. A second attempt to "reason" with the aborigines was made by Le Gendre. In September of 1867 he arrived in person on Formosa to take charge of a punitive expedition with a large force, which the Qing Viceroy had promised to send. Arriving with orders in hand from the Qing authorities in China, he compelled the Qing general on Formosa in charge of the island's troops to supply him with the troops, though only 500 of the promised 1,000 were delivered, and off he marched into southern Taiwan. "We spent the night in a sugar mill, and left at daylight for Pangliau, which we reached the same night. Pangliau extends along the shore at the summit of an arc of a circle, forming a bay, and is, therefore, too open to be secure. The products are rice and peanuts. Women pound the rice and till the fields, while the men are entirely taken up with fishing. To the east, at a cannon shot from the sea, rise abruptly from the valley, high mountains, the exclusive domain of the savage aborigines, who receive from the Chinese (or half-caste) population a certain share of their crops, as a royalty for the lands they have rented to them forever. There for the first time we notice that none leave the village without being armed." This sounds like a description of modern Fangliao. It is interesting that Le Gendre records that the locals paid the aborigines "rent" which sounds suspiciously like a Dangeld. While they waited at Pangliau two Englishmen showed up. They would be indispensible in Le Gendre's later negotiations. Why did they wait at Pangliau? They were having a road built over the mountains, which they promptly set out on once it was completed. Despite predictions of imminent attack, the expedition skillfully blocked the local passes with troop detachments and proceeded unmolested into the aboriginal demenses. Le Gendre proved himself equal to the daunting tasks before him. He recognized that retaliation was pointless and it would be better to obtain a promise of future protection of shipwreck victims from the local aborigines, which he described as consisting of 18 tribes led by a paramount leader named Tooke-tok. It was US policy, he wrote, “to sacrifice a vain revenge (which might be hereafter used as a pretext for retaliation) to the incomparable advantage we would gain in securing ourselves against the recurrence of crimes we had come to punish.” Le Gendre also realized that the aborigines, far from acting out of some savage preference for violence, were aggrieved parties retaliating for attacks on them by foreigners. Finally, the large body of troops he had brought represented muscle that could be deployed in punishment should negotiations break down or agreements be broken. Le Gendre was able to negotiate an agreement which Davidson avers saw attacks on shipwreck victims in the vicinity fall. This agreement included a provision calling for the Qing to build a "fortified observatory at the southern bay" which would eventually evolve into the walled lighthouse at Oluanpi. Le Gendre saw a fort in the area as an urgent necessity which would enabled the Qing to assert their authority over the area, command respect from the Koaluts, and provide a safe haven for the many victims of shipwrecks in the area. In response to Le Gendre's demands, the Qing General Liu erected a walled enclosure in area in just two days. Davidson records that the mission was successful and that the local aborigines often helped shipwreck victims and notified the Qing authorities of their existence. But the "confederation" of local peoples fell apart -- if indeed it had ever existed -- and Tooke-tok found it difficult to exert his authority, records Davidson. After "a hard trip of nearly two months", Le Gendre returned to Amoy. In 1874 he would return to the area with a Japanese punitive expedition as its advisor, along with several other Americans. The Japanese were sent to punish the aborigines for the murder of 54 Okinawan sailors by aborigines of the Mudan area in 1871. The enterprise was doubly colonialist, first against the aborigines, and second, against Okinawa. By "avenging" those deaths, the Japanese would demonstrate that they spoke for and acted on behalf of, the Okinawans as their rulers. That expedition would lead to the famous Battle of the Stone Gate, not far from modern Checheng. But that is a story for another day. REFS: This great blogpost, NYTimes, Davidson, Wiki, here. Basically, if passed, it would mean that when reporting on the recent Sean Lien shooting case, newspapers would have only been able to say "Sean Lien has been shot" or something similar and that would be about it. This new provision in the law substantially restricts speech and media freedom in the name of protecting children and adolescents. But from the standpoint of Constitutional protections of the people's basic rights, is it necessary to use such measure to achieve this goal? But one can't help noting that Taiwan's sensationalistic news, with its constant invasions of privacy -- filming bleeding people hauled off in ambulances, barging into emergency rooms -- has, at least in part, brought this on itself. Perhaps some negotiation with the LY as a body to accept voluntary regulation would stem the necessity for odious legal restrictions? WSJ on the property bubble in the Taipei Basin. I think WSJ errs only in one respect -- the KMT wants the bubble to spill over to other cities, not to restrain it from doing so, since (1) it will make the construction-industrial state firms who support the KMT even more supportive and (2) lots of small homeowners might benefit. Chen Yunlin arrives in Taiwan for more sellout talks. The 100 most influential figures in ROC history shows how contested history is. AU optronics to build $3 billion plant in China. Taiwan salaries expected to rise this year. Good news for locals. Jamestown Brief, as always with good stuff: China's expanding naval presence; China's growing force project capabilities. You already knew if you have been following events, but Google Labs word search (what a tool!) shows how Chinese showed zero interest in the Senkakus until the late 1960s. You can change the base date to even earlier; same result. Deep ocean heating blowing away Antarctic ice much faster than expected. A Taipei District Court judge who found former president Chen Shui-bian (陳水扁) and his wife, Wu Shu-jen (吳淑珍), not guilty in a bank merger case was indicted yesterday by Taipei prosecutors on suspicion of negligently leaking the name of a witness to the public. Judge Chou Chan-chun (周占春) and his secretary, Liu Lee-ying (劉麗英), were charged with malfeasance for being negligent in the disclosure of a witness’ name who was involved in a case involving illegal drug production and transportation heard by Chou, Taipei prosecutors said. Chou and Liu were found to have failed to seal a classified document which had witness names on it. As a result, after a lawyer for the defendant in the case, surnamed Lu, read the document and told Lu about the matter, the witness was threatened and beaten by Lu, prosecutors said. Last month, Chou became the target of some pan-blue political commentators when he, citing insufficient evidence, acquitted Chen and Wu of charges that they laundered money and took bribes from bankers in exchange for manipulating bank mergers. Chou said in the Chen-Wu -ruling that the Anti-Corruption Act (貪汙治罪條例) states that a public official violates the law by taking bribes in exchange for decisions or policies that favor the bribers, but according to the Constitution, the president’s duties do not include overseeing bank mergers, so Chen therefore would have been unable to receive money from banks and reciprocate by helping their merger proposals. What happened to the man who allegedly bribed Chen Shui-bian in the Longtan land deal? Nothing, of course (reading the first page of that article will make your blood boil). What happened to the prosecutors who leaked information to the media? Nothing, of course. Chen's lawyer, Cheng Wen-lung, was hit with disciplinary charges, though. What happened to the prosecutors involved in the crazy skit attacking Chen Shui-bian (Jerome Cohen) Nothing, of course. Remember the group of prosecutors who held a press conference to announce that they would pursue the Chen case to the bitter end -- an apparent admission that not only were they involved in a vendetta, but that they did not have any evidence either. Nothing happened to them too. But don't worry, there's no pattern here. UPDATE: Judge critical of procedures in the Chen case, and published article criticizing the swapping of judges in that case, found unfit to be a chief judge. Those of you in academia, NGOs, and on Capital Hill, note this. Next Media is turning up the heat on the government. With the NCC blocking NextMedia's application for a TV news channel license, the battle is now moving to the internet. NextMedia plans to launch there soon to obviate the NCC's obstructionism. Next Media is planning to distribute set top boxes for internet TV distribution which would have all Apple content (see this annual report, p22). Since this plan was made public pan-Blue legislators have lead a charge to regulate internet content, which NextMedia/News in Motion see as a thinly disguised campaign to prevent NextMedia from distributing its content over the internet. REF: Previous post on the NCC. UPDATE: See second comment for another view. ADDED: Mark Simon of Next Media says this response is completely wrong, further down. VIENNA, 15 December 2010: More than a year after Taiwan-based Next Media Group requested a broadcasting license from Taiwan's National Communication Committee (NCC), the company has yet to receive permission to broadcast news programs. Representatives of Next Media Group have informed IPI that in August 2009 the company applied for licenses for a news channel, a general interest channel, an entertainment channel, a sports channel and a movie channel. The NCC reportedly refused the request twice, eventually allowing only the sports and the movie channels to air and withholding the license for the news and the general interest channels. According to news reports and talks held by IPI with media representatives in Taiwan, the issue of contention appears to be Next Media’s use of realistic computer-generated animation in support of news reporting. The NCC, along with many members of Taiwan's media community, has reportedly expressed concern over the graphic content of some of the other publications of the Next Media Group and the fact that the website of the group’s newspaper, Apple Daily, shows computer-generated animations of violent crimes, sexual assaults, homicides and suicides. Similar animations are also shown on the online news service launched by Next Media in July 2010, where Next TV streams five hours of news programming every day. This led to calls by 20 legislators (19 of them representing the ruling Chinese Nationalist Party - KMT, and one representing the Democratic Progressive Party - DPP) to impose stricter regulations for the internet. The NCC’s Communication Content Department Director, Jason Ho, told the Taipei Times on 22 October that unlike content on TV or radio, the government had adopted a policy of low supervision regarding internet content. In most democratic countries, the allocation of broadcasting licenses is carried out by statutory bodies, which need to ensure their decision-making independence from government and political or economic powers. The National Communications Commission was established by the Taiwanese government in February 2006 to regulate the telecommunications, information and broadcasting sectors. Similar commissions exist in the United States and in the United Kingdom. A spokesperson with the British Office of Communications (Ofcom) told IPI that while Ofcom’s Guidance Notes for Applicants allow for refusal of licenses if “the proposed service [is] likely to involve contraventions of the standards for programs and advertising,” as included in the Ofcom Broadcasting Code, this clause has never been applied. “We have never refused a license on these grounds,” the spokesperson told IPI. In response to accusations of undermining freedom of expression, KMT Legislator Hsu Shao-ping defended the proposal to regulate internet-based Next TV, saying that she was simply doing her job by addressing public concerns over Next TV’s internet broadcasts, which rely on controversial animations that may be unsuitable for certain audiences. Government to attack housing bubble? "Swim across the Pacific Ocean"